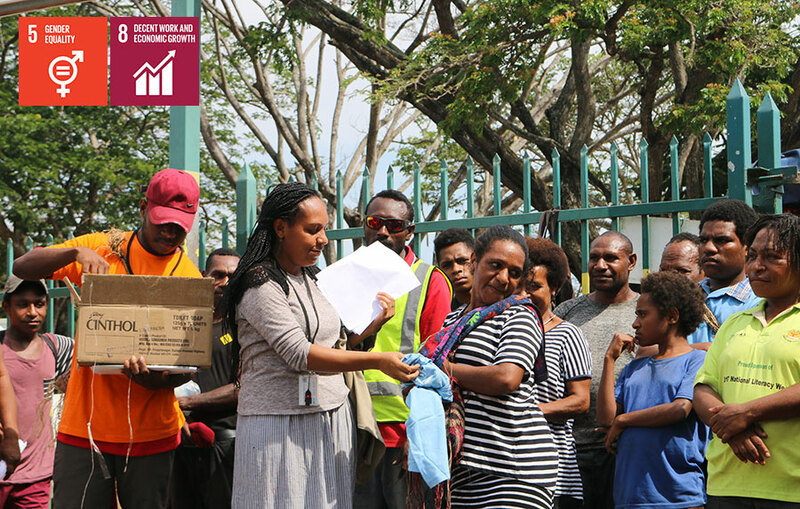 The Safe Cities Programme is an initiative of UN Women, in partnership with the Government of Papua New Guinea, which is helping to address women’s safety and engagement in market activity. UN Youth Volunteer Adrianna Kunjib serves with UN Women’s Safe City Programme. She shares her experience as a volunteer and the inspiration she gets out of her volunteering assignment. UN Youth Volunteer Adrianna Kunjib serves with UN Women’s Safe City Programme. Here, she is seen with market women at Port Moresby's Gordon Market. Because of my experience with the Municipality, I was recruited to assist vendors register in the new database system. My role with the programme is to reach out to vendors, introduce them to the system and make sure they register in the data base. The new registration system aims to protect vendors from harassment, or being pressured to pay bribes for services. With this new system in place, each vender receives a receipt that documents their payment and protects them from being asked to repay their municipality fees. I have witnessed how creating an environment where women feel safe and protected can contribute to economic empowerment and prosperity. And to think that I was a small part of this great initiative, encourages me to take greater steps and feel confident to seek opportunities to grow within my community. I am very happy that I was selected to volunteer for the UN. I am particularly happy, because I was able to make my mother proud for having a daughter who is working with an organization that is known to be for the people.